Twenty-seven artistically gifted students from the Fashion Design Academy at Santaluces High School in Lantana, Florida have designed women's apparel and costumes for the Barbie� doll for their class project. The class professor is Ms. Michelle Matella. The curriculum included developing a sketch of the design, creating a pattern, sewing the clothes or costume and writing an essay about the design. The varied designs for the Barbie� doll by the teenage students are now showcased in the Barbie�: History, Fashions & More exhibit at the Museum of Lifestyle & Fashion History in <?XML:NAMESPACE PREFIX = ST1 />Boynton Beach, Florida. The Museum is located inside the Boynton Beach Mall at 801 N. Congress Avenue, Suite 483 (in north wing), Boynton Beach, FL. The academy serves 130 students each year from School District of Palm Beach County, Florida. It is the only Fashion Design Program that is part of the Palm Beach County Choice Programs. Students entering the program do not need to have any prior knowledge and upon the 4 year completion of the program they will receive a Vocational Certificate in Fashion Design for the State of Florida. The Program has been in existence at its current level for the past 12 years. During the most recent 4 years it has become a full academy program. Every year there are approximately 20 to 25 graduates in the Fashion Academy. Ken is turning 50 in 2011. Visit the Barbie exhibit at MLFH to view a display of Ken and Barbie dolls through the years. We've got Ken from when he went from a fuzzy head of hair to plastic! Ken is turning 50! The Ken� doll was introduced by Mattel in 1961 as the boyfriend of Barbie�, the Teen-Age Fashion Model. He is two-years younger than his gal-pal Barbie�. Ken Carson was named after the son of Mattel�s co-founders, Ruth & Elliot Handler, who was named Kenneth. He has been Barbie�s first and only true love. When Ken� arrived 50 years ago, he was featured with flocked (fleeced) blonde or brunette hair, and he wore red cotton swim-trunks, cork sandals and carried a yellow terry-cloth towel. In 1962, Ken�s coiff went plastic. By 1965, Ken� and Barbie� had an official wedding ceremony but Barbie� already had her wedding dress by 1959 that retailed for $5.00. Mattel introduced the 1965 wedding as the �Wedding Day Party� that included a tuxedoed-Ken� doll and a �Wedding Party� doll case. Ken has always been as equally stylish as Barbie�, but in the beginning years his physique was boyish and sensitive-looking so in the mid-1960s his image was remodeled to be more athletic because his pubescent features seemed outdated. This change in his image also meant that his clothes had more masculine-sounding names like Ken�s 1962 �Casuals� was renamed �Holiday Hiking� in 1965. Responding to the Civil Rights Movement and Black Pride Era of the 1960s, Mattel added black dolls. In 1968, Ken was joined by his first African American friend named Brad who was the black boyfriend for Barbie's first African American friend named Christie. However, the first full-fledge African American Ken doll appeared in the 1980s. The Museum of Lifestyle & Fashion History in <?XML:NAMESPACE PREFIX = ST1 />Boynton Beach, Florida is celebrating 50 years of Ken in its Barbie: History, Fashions & More exhibit. This exhibit has been modified from its original display that opened in year 2009 for Barbie�s 50th birthday. This Barbie & Ken exhibit at MLFH is not affiliated with Mattel. The Barbie� exhibit is an anthropological, multi-media, history exhibition with numerous dolls, family members, friends, clothes and accessories on display. On August 3, 2010, a modified format of the Barbie exhibit re-opened and is still on display, NOW! The new modified version of the Barbie exhibit is a continuous display but the items in the exhibit will be displayed on a rotating seasonal basis; and during the Christmas holidays (Nov-Jan) a special display of Holiday Barbie dolls and ornaments will be showcased. Biloxi native designs shoes for � Barbie�? BILOXI - At 21 years old, Biloxi native Rebecca Washum has achieved a feat most aspiring fashion designers can only hope to accomplish during their tenure in the competitive industry � designing one-of-a-kind shoes exclusively for that legendary American icon, the Barbie� doll. As a third-year accessory design major at Miami International University of Art and Design, Washum's signature Malibu Barbie� peep-toe wedgie was one of 16 footwear designs selected to be showcased at "Barbie�: The Golden Anniversary," a history and anthropological exhibit at the Museum of Lifestyle and Fashion History in Boynton Beach, Fla.
"I wanted to convey the spirit of what Barbie is all about and the colors of Malibu during that time frame in Barbie�'s extensive, fun and poppy history," said Washum, a 2007 graduate of St. Martin High School. "Deep turquoise, hot 'poppy' pinks, sunny yellows and lush greens are very indicative of the fun, carefree feeling during that period." The exhibition developed by the museum covers 50 years of Barbie�'s cultural influence and includes vintage Barbie� dolls, such as the original 1959 Barbie�, 1960 Busy Gal Barbie�, 1970s Malibu Barbie� and accessories, 1963 Midge doll, 1961 Ken� dolls, and 1970s Skipper doll. Also on display is the Diane Von Furstenberg original jersey wrap dress designed for the first-ever 50th Anniversary Barbie� Runway Show in 2009 during Mercedes-Benz Fashion Week. � Barbie� is inspired by Lilli. Although the Barbie�: History, Fashions & More exhibit has hundreds of dolls, some Barbie� owners and collectors have inquired after the exhibit opened if they could provide their dolls to the Museum for display in the exhibit. Anyone who wishes to loan or donate items to the Museum may contact the Museum via email, phone or postal mail and provide their contact information and a description of the item that they wish to provide to the Museum. Contact can be made to the Museum of Lifestyle & Fashion History at P.O. Box 6127, Delray Beach, Florida 33482 or e-mail BarbieExhibit@MLFHMUSEUM.org or e-mail BarbieExhibit@MLFHMUSEUM.org. The Barbie� doll was invented in 1959 by Ruth Handler (co-founder of Mattel), whose own daughter was named Barbara. Barbie� was introduced to the world at the American Toy Fair in New York City. From the time of its introduction to the market, the Barbie Doll has enjoyed unparallel success and continues to be a prized collection for the collector, still among the top choices of play toys for children and a benchmark of comparison for other dolls. Even though the success of the doll continues, there is also still the controversy from a segment of the public surrounding the Barbie� Doll's portrayal of beauty and a body figure that would be impossible to obtain if the doll was a real person. The Ken� doll in the Barbie� line of dolls was named after Ruth Handler�s son. 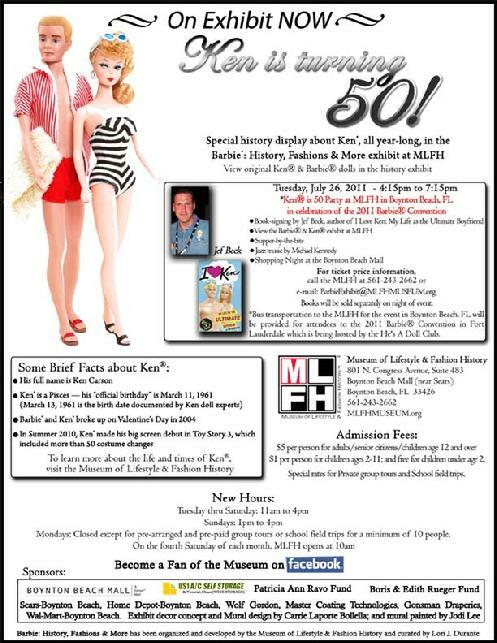 For more information, call 561-243-2662 or e-mail: BarbieExhibit@MLFHMUSEUM.org. In addition to the Barbie�: The Golden Anniversary exhibit, the Museum has on display an exhibition titled Fashion Treasures which consists of a display of fashion clothes, household objects and other artifacts from the late 1800s to the 1960s along with historical data about how these artifacts and history relating to any particular period in time is reflected in the fashions and lifestyle of that era. One of the primary missions of the exhibits at the MLFH is to showcase the strong, inseparable correlations between history, fashion and lifestyle. The items in the Fashion Treasures exhibit are from the MLFH permanent archival collection. Fashion Treasures exhibit at the Museum is a permanent on-going exhibition with periodic changes/additions of different archival artifacts. On August 3, 2010, MLFH will premiere its Lilly exhibit about the more than 50 years of Lilly Pulitzer Palm Beach fashions. 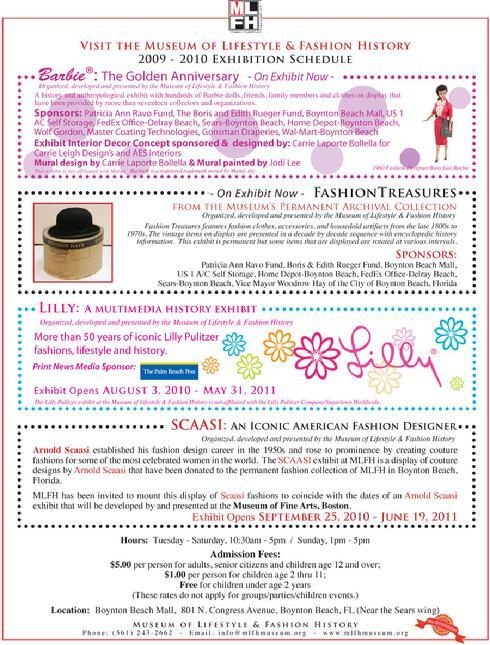 Lilly will be display August 3, 2010 thru May 31, 2011. Since 1999, the Museum of Lifestyle & Fashion History has hosted more than twenty exhibitions including traveling exhibitions from the Smithsonian Institution of Washington, D.C. The exhibit topics have included the history of lunch boxes, magazine covers as well as displays about hats, handbags and gloves. In year 2004, the MLFH was designated as the Best New Museum by the Broward-Times Newspaper. From 2003-2005, the Museum was located in a rent-free 8,000 square feet facility in the former Pineapple Grove Shops Plaza located in the 300 Block of Pineapple Grove Way in the Main Street District of Downtown Delray Beach, Florida. That space in the plaza was generously donated by the owners, A.M. Davis Mercantile. The Museum had to move from that location because when the plaza was sold, and the new owner demolished it in 2005 along with all buildings in that entire City block for redevelopment although the redevelopment has not happened yet and the site is presently mostly vacant land. Although MLFH had been without a facility for a few years, MLFH has continued to offer and present various programs such as the regular monthly Narrated Bus Tours of Historic Delray Beach; the Children's Mathematics Narrated Bus Tour of Historic Delray Beach; the annual Children & Parents Day Winter Wonderland; and the annual Swedish Enchantment event. For the bus tours, the accolades have included Best Bets in Palm Beach County in 2006 & 2005 by the Gold Coast Edition of Guest Informant Magazine; and in 2006, the Museum's Narrated Bus Tours of Historic of Delray Beach were selected as Unique Travel Gem by AAA Travel Home & Away Magazine of Mid-America. In May 2008 and June 2006, the Museum's Narrated Bus Tours of Historic Delray Beach were selected as Best Tour of the Town by The Palm Beacher & Gold Coast Magazines. Barbie� is a registered trademark of the Mattel Corporation. Barbie�: The Golden Anniversary exhibit has been developed, organized and presented by the Museum of Lifestyle & Fashion History. This exhibit is not a Mattel program.